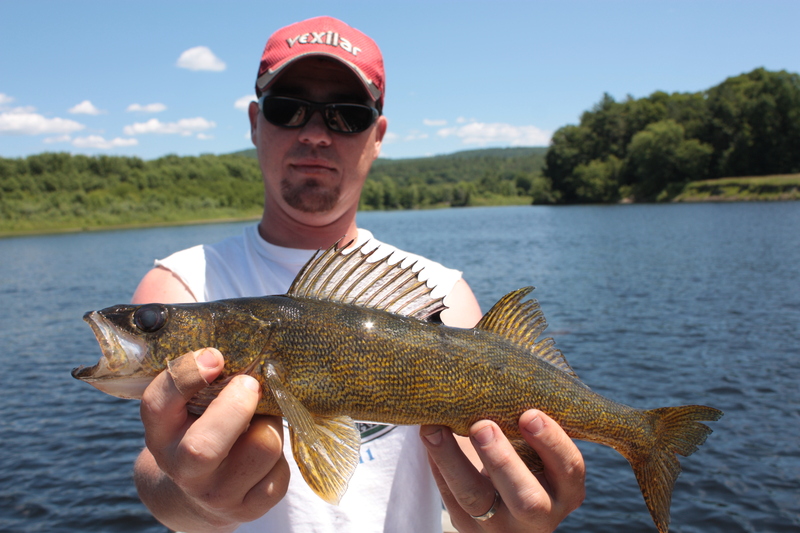 After Bobby had a good day with numbers of walleye on the Connecticut River on Saturday, I got out of work early so we could make a second trip. We were on the water just after 1 pm with the sun high and warm. The wind came in spurts relieving us from the heat. 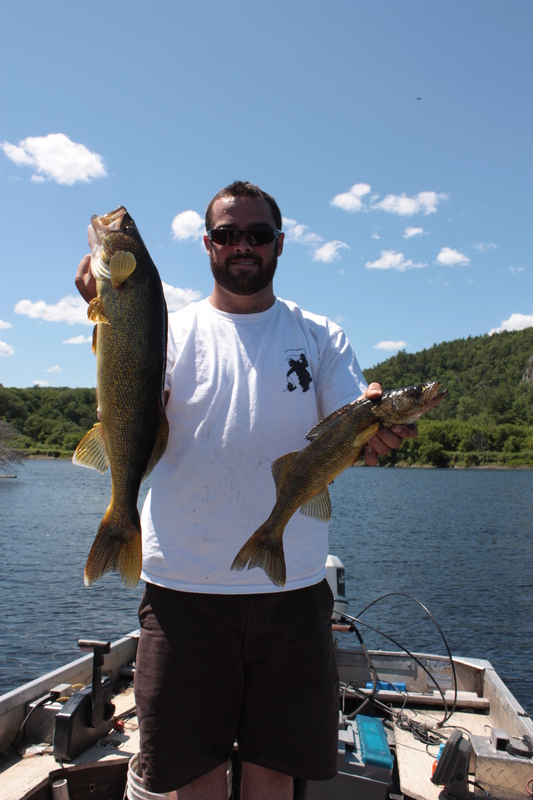 After 10 minutes of jigging we had both boated and released a fish slightly over the 16 – 18″ slot. We were hopeful that the size run would continue as the average was not nearly as large the day before. After releasing the fish, we got checked by a pair of friendly NH wardens and got back to fishing. A few minutes later, we were both hooked up with another set of netter fish. This time was a different story though… Bobby requested the net first, so I grabbed it intending to get his fish for him. 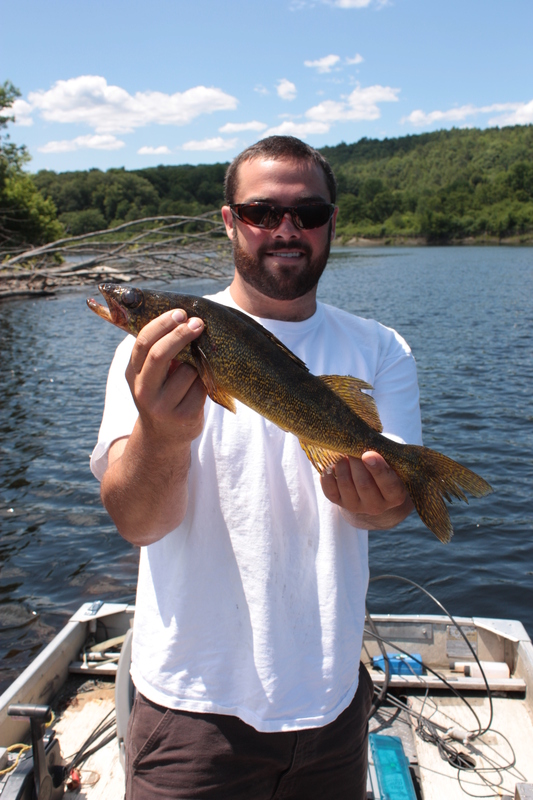 As I stood tall with the net in hand, I got a glimpse of my first big Vermont Walleye. I told Bobby his fish would have to wait and gave him the net to get mine. 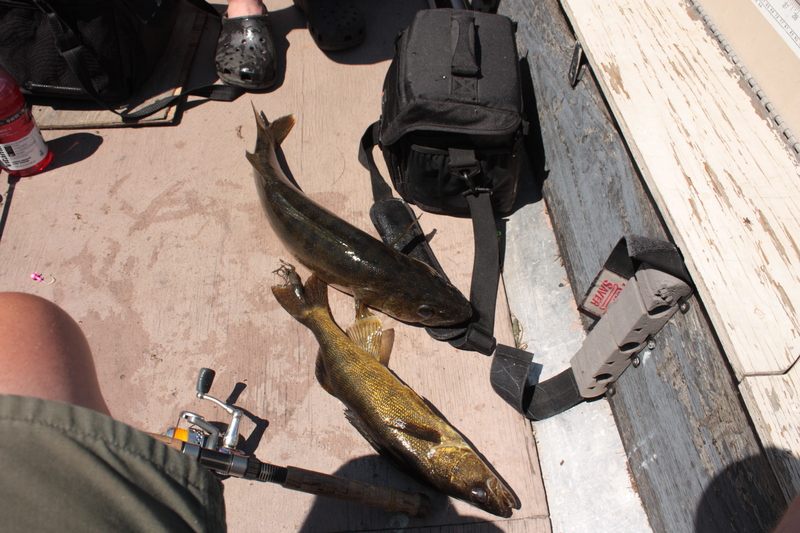 A few seconds later, we had a 26″ – 6.5 pound male flopping about the floor of the boat. Trying not to get too excited we dunked the net to retrieve Bobby’s 19″ stringer fish. Look at the size difference 7″ makes! What a start to the day! 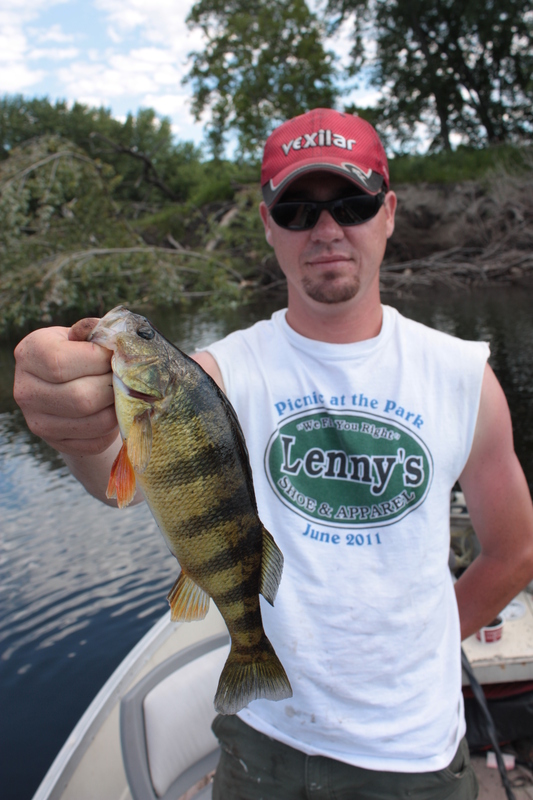 We continued to pound the bottom around the structure far to frequently snagging into an ancient ax cut tree surrounded by numerous rockbass, perch, and apparently hog walleye! We fished two other spots that were similar in appearance but more numerous in fish. 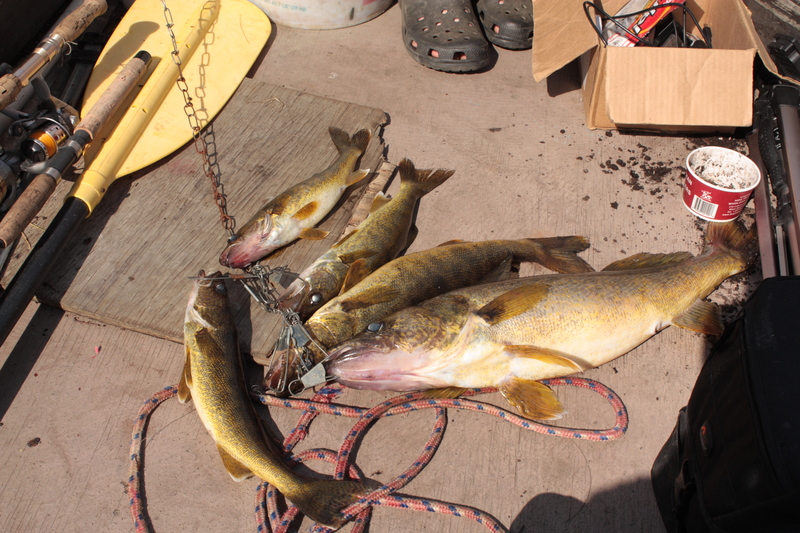 We caught 20 walleye total. Five were over the slot, four were in the slot, and the remaining 11 ranged between 12-15.5″. Quite a day for an underestimated fishery! 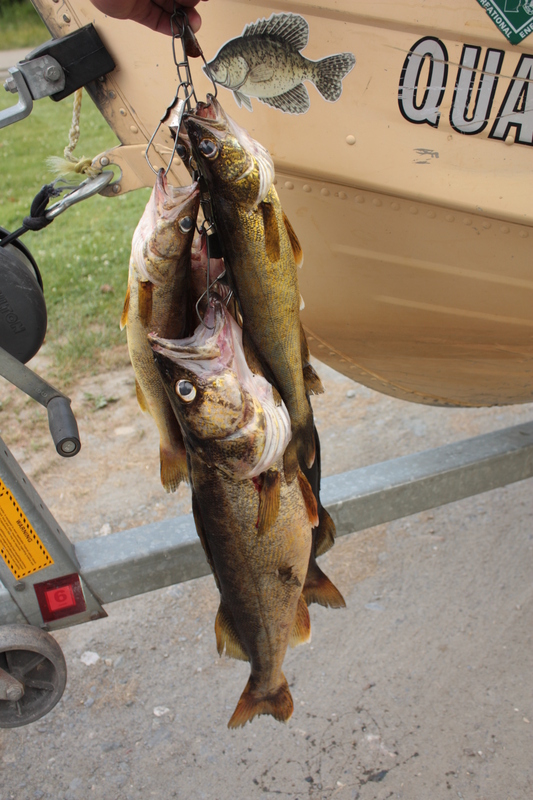 Check out the video of some fish we caught on our YouTube page. We burned through quite a few jigs due to live action wood bites. We used pink and chartreuse but found no difference in the quality or frequency of the bite. Even with 1/4 jigs the current was moving our jigs at a fairly fast rate on the drop. 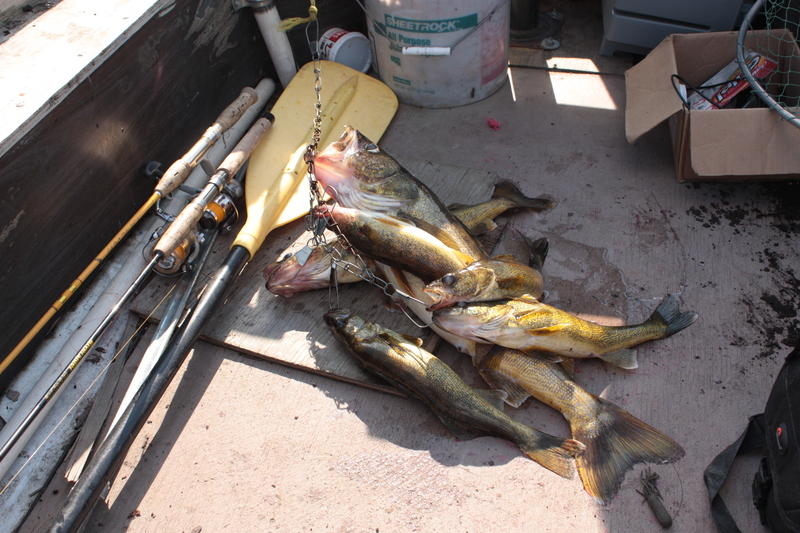 Walleye fishing in the wood could get expensive!!! Enjoy a few pictures from our trip. 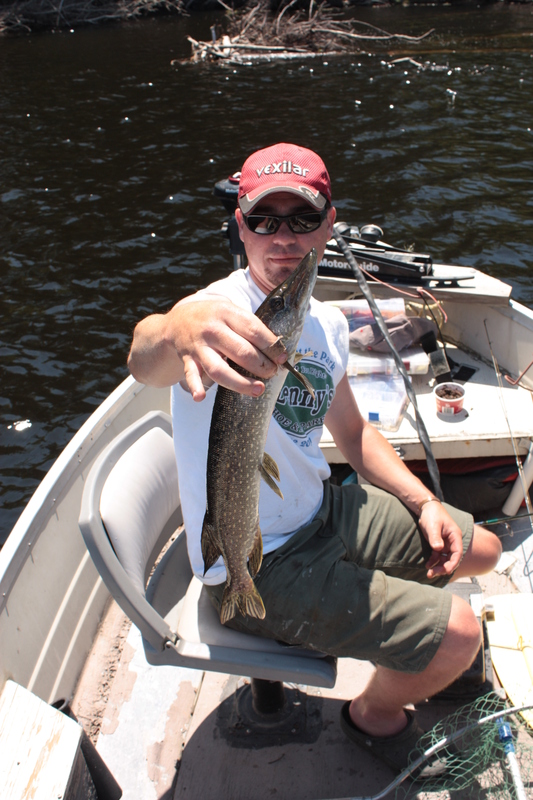 Even though we saw several pike feeding on the surface, we only brought one into the boat. 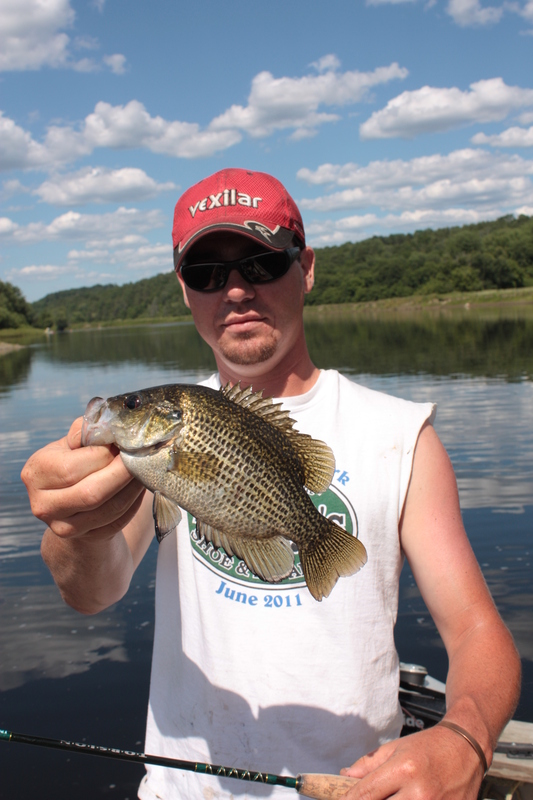 The rockbass were abundant at each log jam we fished! The final shot of the stringer. We both kept three fish. We each had one over and two under the slot.